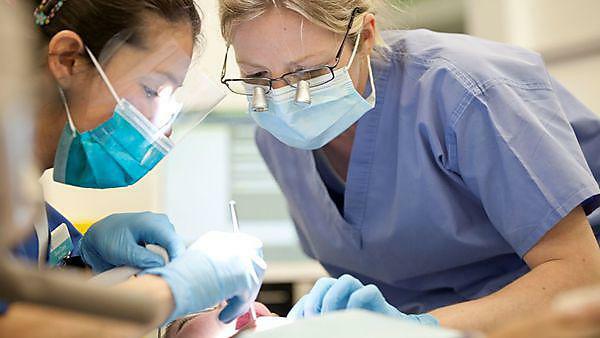 The University of Plymouth’s Peninsula Dental School has come joint top of a key UK survey that asks students to rate their institution based on teaching quality. 100 per cent of students on the BDS (Hons) Bachelor of Dental Surgery course said that they were ‘satisfied overall with the quality of the course’ in the 2018 National Student Survey (NSS) – putting it joint first out of 16 dental schools in the UK. In addition, 100 per cent of Plymouth’s dental students said the course was intellectually stimulating, 100 per cent agreed they felt part of a community of staff and students, and 100 per cent agreed that the library resources (such as books, online services and learning spaces) had supported their learning well. Run annually, the NSS is an anonymous survey that gathers opinions from students about their undergraduate experience, asking them to provide honest feedback on what it has been like to study on their course at their institution. The survey is designed to help prospective students decide what to study and where, as well as help institutions themselves shape their courses for future students. The University of Plymouth welcomed its first dentistry students in 2007, and uses a pioneering primary care model focused on developing students’ sense of social awareness on top of their clinical expertise. “Studying dentistry with Peninsula Dental School has been a privilege. The school have supported our every need and work tirelessly to ensure that the course will prepare us for the professional world of dentistry. I am indebted to them and feel very proud to be associated with them. Thank you for everything! The dental school’s results come at the same time as those of Peninsula Medical School at the University of Plymouth, which finished in the top two out of medical schools offering primary medical qualifications in the UK, with 98 per cent of students satisfied overall with the quality of the course. Our state-of-the-art facilities include a Life Sciences Resource Centre, telematic lecture facilities and a 32 pod Simulated Dental Learning Environment (SDLE). The SDLE enables our students to learn and experience all aspects of providing dental care in a safe, controlled environment, where ‘phantom heads’ allow you to practice and achieve the highest skill levels before treating patients in the clinical environment. We also have four NHS training clinics providing a substantial service to over 10,000 NHS patients per year. These include state-of-the-art dental equipment, an on-site decontamination unit and a dental technical laboratory.